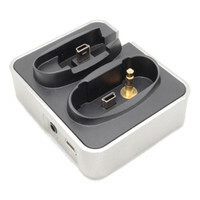 The AR2 Double Dock is compatible with the Samson AirLine Micro wireless system. This handy docking station provides a secure base for the AL2 transmitter during recharging and the AR2 receiver during operation and/or recharging. Also featured is a USB DC input for power and recharging with cables included and a 3.5mm unbalanced audio output. This entry was posted in Samson and tagged PA-DJ-and-Lighting. Bookmark the permalink.